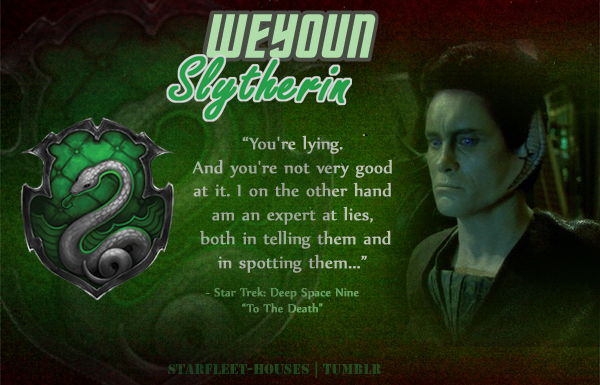 Weyoun - Slytherin. Weyoun: One of the masterminds behind the Dominion, Weyoun is very determined, skilled with negotiations and a complete master of spying, lying, and beating his enemies down till they retreat in fear. He’s also loyal, to the Founders. Wallpaper and background images in the nyota Trek: Deep Space Nine club tagged: deep space nine star trek ds9 weyoun jeffrey combs vorta dominion forces trek meets hogwarts.